Daphne Osena-Paez introduces hidden gems in Indonesia, China, and Malaysia. 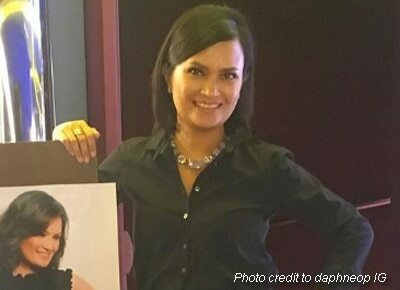 Having a career that has spanned more than two decades in the news and in the lifestyle industries, Daphne Osena-Paez admitted she was happy to take on a new hosting adventure in a new web series called Red Talks with Daphne which has her traveling to countries like Malaysia, Indonesia, and China. “I want to take this time to say thank you to Air Asia. I don’t want to be emotional but this is really way beyond what I ever, ever dreamt about because I have been working on television for many, many years and I’ve never seen my work in the silver screen that big. So to launch a program like this and to be welcomed by Air Asia and to be part of your family, I really do paraphrase Leonardo DiCaprio when I say I do not take this for granted. Thank you. I treasure this and I have learned so much already and I cannot wait to tell more stories,” she said during the Air Asia presscon held last March 20 in Taguig city. Daphne said one of her favorite places from the series was when they shot in the city of Jogjakarta, Indonesia. “Jogjakarta it is a magical place. It’s one place where you can hit two major temples. So there’s Phram Banan, it’s a 9th century Hindu temple and Burubudor from the 8th century. So I was really looking forward to seeing those places. There’s a story behind our journey when we finally got to Burubudor,” she shared. The Red Talks with Daphne host also said the trip was interesting for her both on and off camera. “We were sweating. It was so hot in Jogya but I had a whole glam team with me. Also behind the scenes my husband (Patrick Paez) was there so he was helping carry my bag (laughs). We had an amazing team. A lot of it is also the behind-the-scenes story because when you’re traveling it really is about the journey sometimes also. We visited Kota Kede and met some silversmiths of Arkumjogja in Indonesia. It was very, very memorable,” she said. Red Talks with Daphne will premiere on the AirAsia Philippines’ Facebook page on March 25, Saturday.